”Ancient Greece; From Prehistoric to Hellenistic Times” by Thomas R. Martin. The theory of cultural diffusion may also explain cultural similarities. It explains the commonalities between the pre-contact, complex civilizations of North America and their Central American counterparts. Arguably, the vast region that has become known as the Great American Southwest may also be considered an extension of a pan- ‘Greater Meso-America’, albeit more likely through somewhat indirect trade/exchange routes rather than more direct colonization; the similar aesthetics are especially compelling. These are generally quite alike, while specifically different. 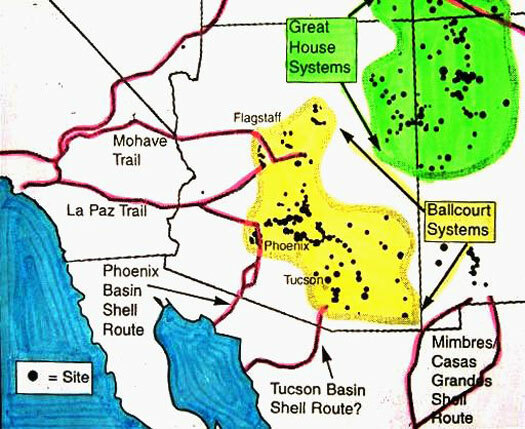 Trade networks (pix 1 & 2) apparently extended throughout the Southwest, connecting this approximately 36,000 square-mile expanse to various remote, but adjacent, areas, notably including Meso-America. 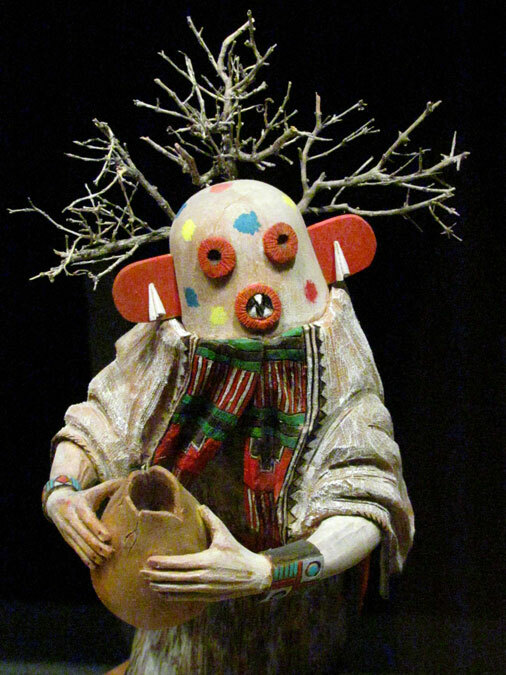 Exotic items clearly imported from Central America have been repeatedly uncovered in the archaeological records within the traditional territory of the northerners collectively known aptly as the ‘Pueblo’, or town peoples. 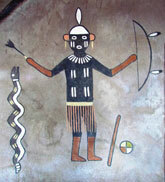 Such items include, but are not necessarily limited to, copper bells and macaw-parrots (the Hopi people of U.S. northern Arizona do indeed have a parrot clan - pic 3); utensils such as corn-grinding mano-metates; architectural features such as platform mounds, ball-courts (pic 4) and residences; and particularly their cultivated plants that originated in Mexico, especially the ‘Three Sisters’, maize-corn, beans and squashes. This influence is also seen in pottery styles and artistic iconography, the latter exemplified by the mysterious and ubiquitous T-shape symbol (as found in Pueblo doorways and tablita headdress, plus Meso-American funerary masks). 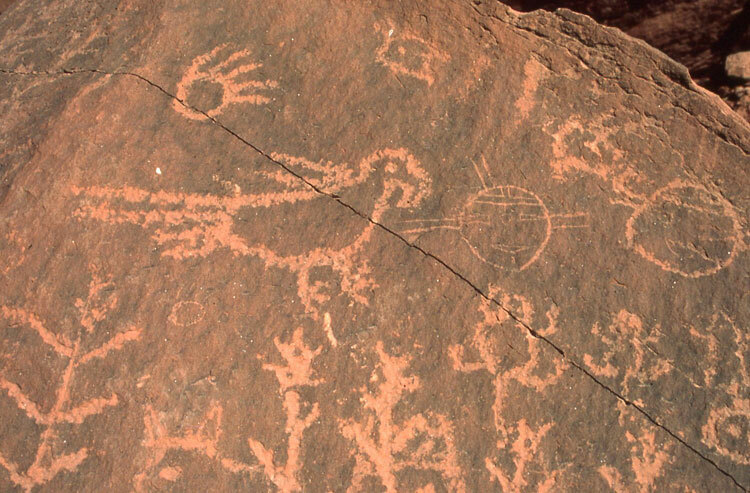 The more abstract concept of a Great Horned Serpent, similarly known in Meso-America, permeates Puebloan art and cosmology, and spread beyond onto the distant Great Plains and the Mississippi Valley river drainages of the ‘Mound-builders’ (the latter of whom did build pyramids of their own . . .). This gigantic snake does indeed seem markedly similar to Quetzalcoatl of the Aztec/Culhua-Mexica and that of the Mayas’ Kulkulcan. 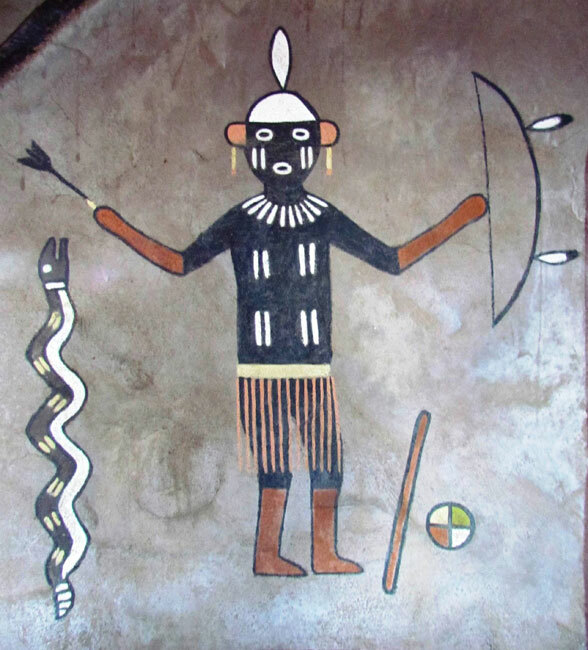 Remarkably, there seem to be some linguistic cognates, too, similar words with identical meanings but in different languages: the Hopi have named this serpent Polokon and the Zuni of western New Mexico call the snake Kolowisi; this is very much like the aforementioned Mayan term. 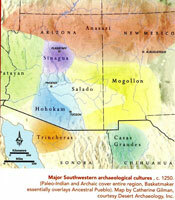 Zuni is actually said to be an ‘isolate’, related to no other known language. But, some have theorized that it may very well be related to Mayan, both of which may belong to the Punutian languages(?) The Hopi language itself is definitely related to the Mexican Nahuatl, both deriving from the great, widespread Shoshonean, or Uto-Aztecan linguistic group. Furthermore, the Hopi word for ‘eagle’ is kwahu and ‘house’ or ‘shelter’ is ki, much like the Mexica words cuauhtl and calli, respectively. As for other parallels, it is intriguing that the Hopis’ Masau’u (Masaaw) is their deity of fire, the temporal earthly plane and - that quintessential Meso-American theme - death, indicating a probable, distinct southern influence. He is also known as the ‘Skeleton Man’, further evoking Mexican regional imagery. Of course, rain-divinities have been understandably important to these farmers in both places. Another example is the Dineh (‘Navajo)’ of the same region who have traditions in common with both Pueblo peoples and so with Meso-Americans, indirectly at least. Apparently this has occurred through the same diffusion process, and although they are instead Athabaskan speakers like their Apache brethren, about a third of all Dineh clans are actually Pueblo in origin (and the former even have a Mexican clan). Reflecting this is the fact that all of these peoples have narratives of the mythical Hero Twins (in Meso-America, this is especially notable with the Maya). While versions of these stories vary, the overall concept is identical. 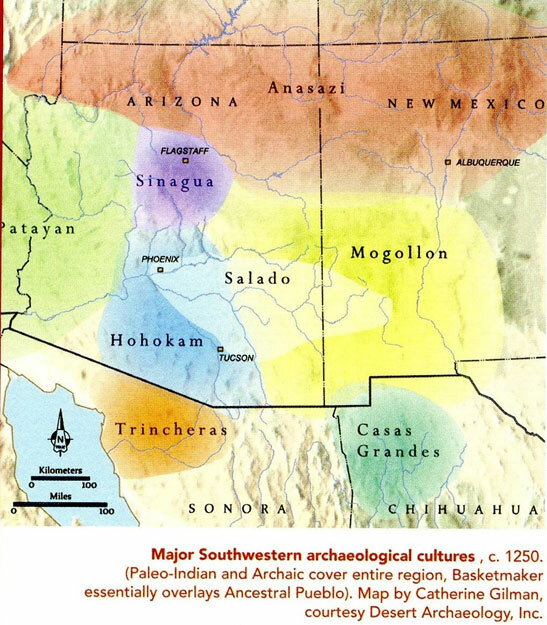 People do indeed transform and reinterpret the cultural traditions that they adapt, but the origins can still be traced to their source without much reasonable doubt; so it would seem with the diffusive interaction between groups like the Meso-Americans and their influence on Pueblo villagers like the Hopi and, thus the Dineh. Items certainly have spread northward. Some have even theorized that traders themselves, known as pochteca in Mexica Nahuatl, may have too; but without any transposition other than their own two feet, this seems somewhat questionable. However, whether from the Maya country, then along the Gulf, to the North of Mexico, or from the centrally located Valley of Mexico and through the deserts to Pueblo lands, there has existed a relatively unimpeded and porous ‘diffusion corridor’. 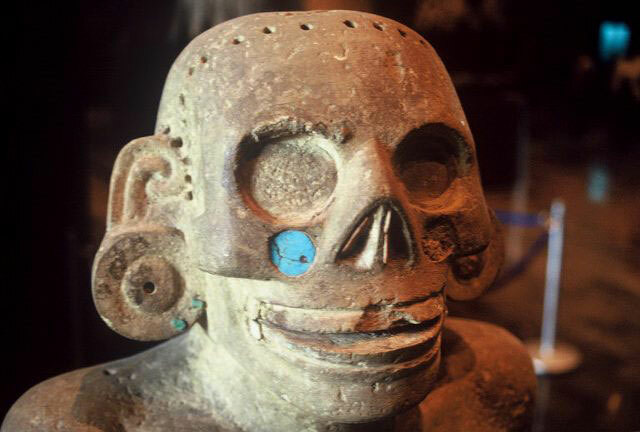 While it is true that turquoise (pic 8), for example, was exported from north-to-south, most of the influence went via opposite routes, for debatable reasons. Some southern concepts either never even arrived northward at all, or diluted until they were unknown to the northernmost Four-Corners area (where the states of New Mexico, Arizona, Utah and Colorado meet); the Puebloans did not possess any known jade, construct great pyramids and huge temple-complexes, nor use any written language, per se, like that of the Maya. 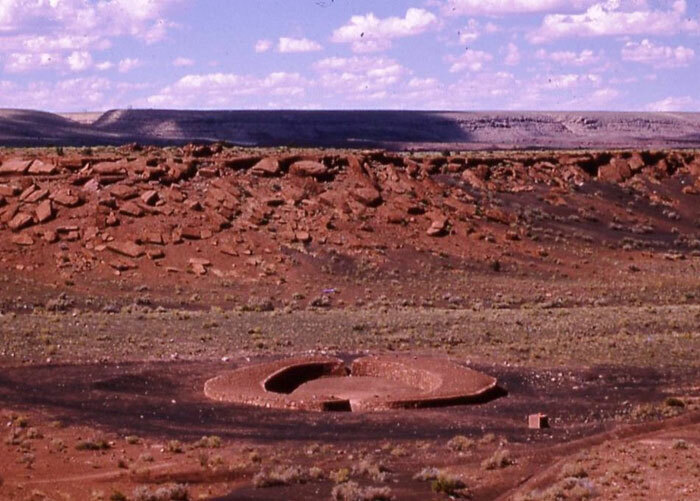 Yet, astronomical observatories like those of the Maya may have been the intended purpose of the Four-Corners Pueblo towers, and several of these Southwestern pueblos - like Mesa Verde’s Cliff Palace and Chaco Canyon’s Pueblo Bonito - were quite large, reminiscent of Central American communities such as Teotihuacan, ad infintium. Tellingly, nineteenth-century American settlers did have the distinct impression that the Mexica themselves had actually built the ruins that they had found throughout the Southwest. 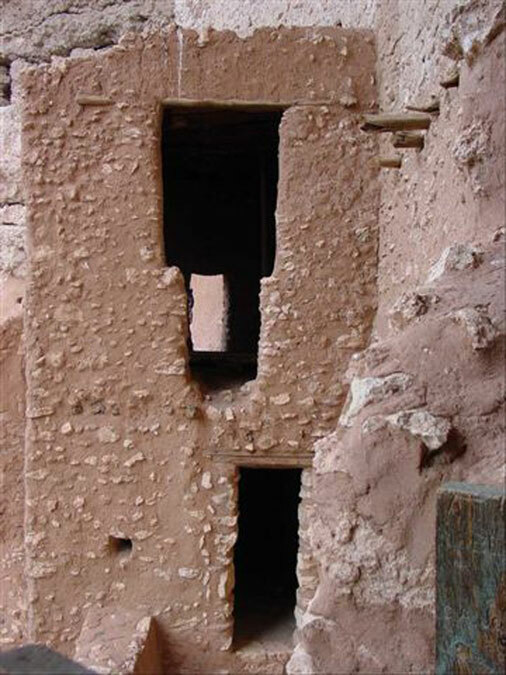 So much so, that they labeled these sites with misleading names like ‘Montezuma Castle’ and ‘Aztec Ruins’ (located in Arizona and New Mexico, respectively, and probably indicating ancestry with their architects and peoples like the Zuni and Hopi...). The newcomers also inaccurately advertised pilfered Puebloan artifacts for sale as ‘Aztec relics’. 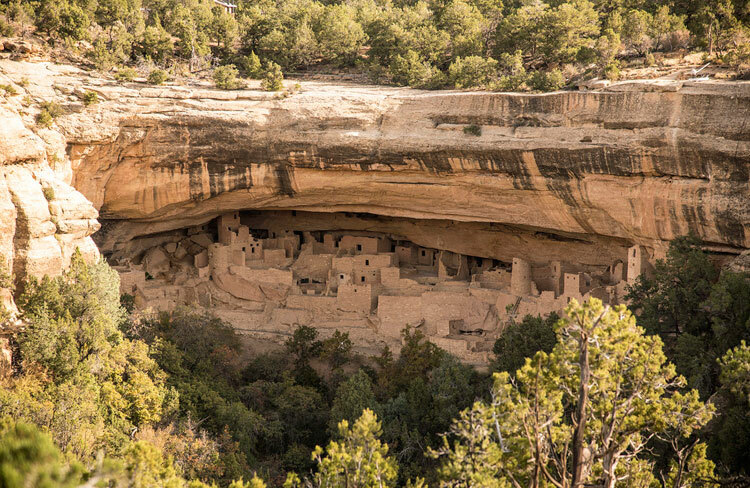 These misnomers may not only have been a misconception, but also a way of rationalizing the conquest of Pueblo lands by attributing these buildings to some other, distant (if related) civilization. But regardless, the timeline is equally erroneous, because most of these sites were vacated by around the turn of the fourteenth-century and the Mexica capitol of Tenochtitlan was not founded until at least twenty-five years later. Chronicles from both of these neighboring regions do indeed refer to epic migrations, though, seemingly such as that which occurred in the Southwest around 1300 CE. They also have made comparable references to their emergence from underworlds and searching for a Promised Land (known as Tuuwanasavi, the ‘Center Point’, in Hopi). The Zuni’s verbal histories mention, ”stone houses that may yet be seen...” just as the Aztec-Chichimeca state that, ”The remains of what [was] made and left behind... can still be seen, among them the structures of stone and earth...” While these are obvious references to the ruins in their two respective cultural areas, the verbiage still seems too similar to be entirely coincidental. 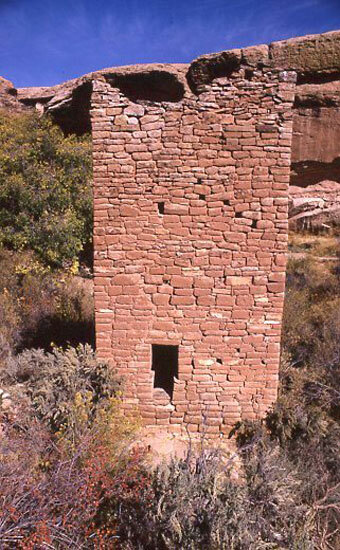 As for the Hopi, they have used the term, “The footprints of our ancestors” to describe the ‘ruins’, an apt term for archaeological sites in both North and Central America. 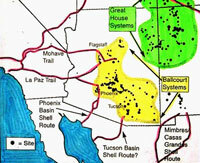 The influence of Meso-America still endures in the Great American Southwest. This is a continuous source of ambivalence to a contingency of Southwestern Americans. They habitually consume the aforementioned Mexican foods and unknowingly use many Anglicized Nahuatl loan-words daily: Tomato; avocado and guacamole; chocolate; coyote; possibly even ‘shack’ and ‘salamander’. But, ironically and despite such major contributions, these very same residents of El Norte often prefer that the people themselves remain ‘South of the Border’. 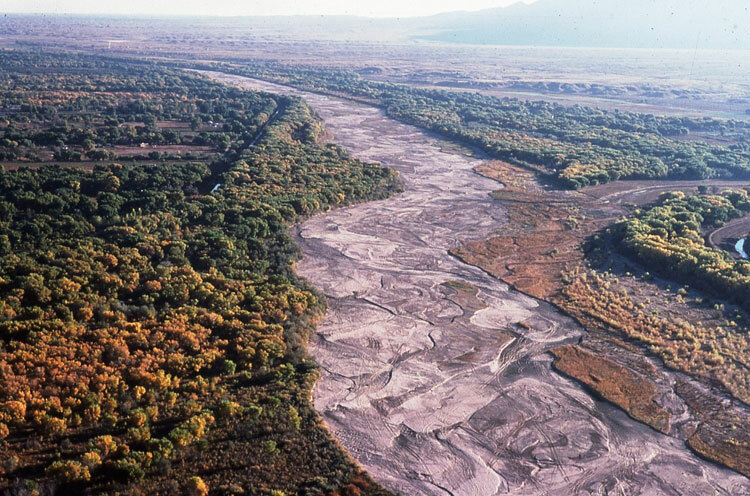 • Pic 10: National Park Service Photo.